If you’re struggling to drink “normally,” but don’t want to quit drinking altogether, you should know that abstinence isn’t the only option. There’s also the Sinclair Method. The Sinclair Method can significantly reduce your drinking without requiring you to quit cold turkey. Although the treatment hasn’t gained much traction in the U.S. yet, it’s affordable, can be done at home and—most importantly—it works. First developed in Finland, it is an accepted form of treatment there and in the U.K.—and it’s slowly catching on with U.S. doctors as well. In this post, you’ll learn about what the Sinclair Method is and why it works so well for alcohol addiction and overdrinking. The Sinclair Method, or TSM, is a treatment to reduce or stop drinking by taking craving-reducing medication in a specific way. Abstinence-based treatments, such as Alcoholics Anonymous (AA), ask you to stop drinking as soon as you start the program. TSM, however, realizes quitting cold turkey is difficult for many people, so it encourages them to drink while they’re taking their anti-craving medication. Although this may sound counter-intuitive, here’s the result: The medication blocks the brain’s alcohol “reward” signal, reducing the motivation to drink. When following this method, doctors typically prescribe naltrexone. However, not every doctor tells their patients to take naltrexone in the same way. For example, some doctors encourage patients to quit drinking before they start taking the drug. TSM is different. You can still drink while taking naltrexone. It may not reduce drinking immediately, but eventually, you may notice that you can stop after just one or two drinks. Some people end up quitting alcohol altogether. As one recent study found, medication for alcohol abuse and dependency is severely under-prescribed by doctors—even though there’s plenty of research to support its effectiveness. In a series of clinical trials, Dr. John David Sinclair—who developed the Sinclair Method— found that naltrexone didn’t help if the patient was told to remain abstinent. However, if the medication was paired with drinking—specifically, if naltrexone was taken one hour before the start of a drinking session—it was effective and safe. 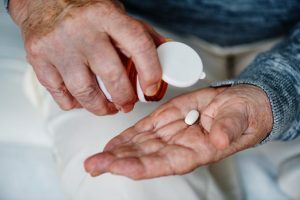 And while the strict terms of TSM are still up for debate in the scientific community—some doctors find the medication to be more effective when taken at the same time every day instead of one hour before drinking—it is generally agreed that naltrexone significantly reduces heavy drinking, cravings, and relapse episodes. How Does the Sinclair Method Help Alcohol Addiction? Before we go over how TSM helps, we should ask, how does alcohol dependence manifest in the first place? Your brain releases endorphins when you drink, and endorphins make you feel good. Over time, your brain may start to connect alcohol with pleasure. You may start to drink to get that same euphoric feeling. Even if you know it’s not healthy, it’s hard to stop because the craving now seems uncontrollable. If the problem is the connection between pleasure and alcohol, then we need to break that connection. One way of breaking it is by using a medication to block endorphins when we drink. That’s what naltrexone does. With endorphins blocked, you don’t experience the normal “buzz” or satisfaction from alcohol. Over time, as you have more and more drinking sessions that result in zero or very little pleasure from alcohol, you start to care less about drinking. Because these issues sometimes can’t be addressed by medication alone, counseling is recommended. At Ria Health, we prescribe anti-craving medication, but we also assign you a personal recovery coach. Your coach can teach you techniques, track your progress, provide encouragement, and walk you through setbacks. Will the Sinclair Method Work for Me? If you’re thinking about trying the Sinclair Method, here’s what you should consider. Your goals—whether to drink less or stop completely—are in reach! Start our at-home program today to begin seeing results.